The Dracula legend has been redone a hundred times over and in 1990 the Prince of Darkness returned to us in Dracula: The Series. 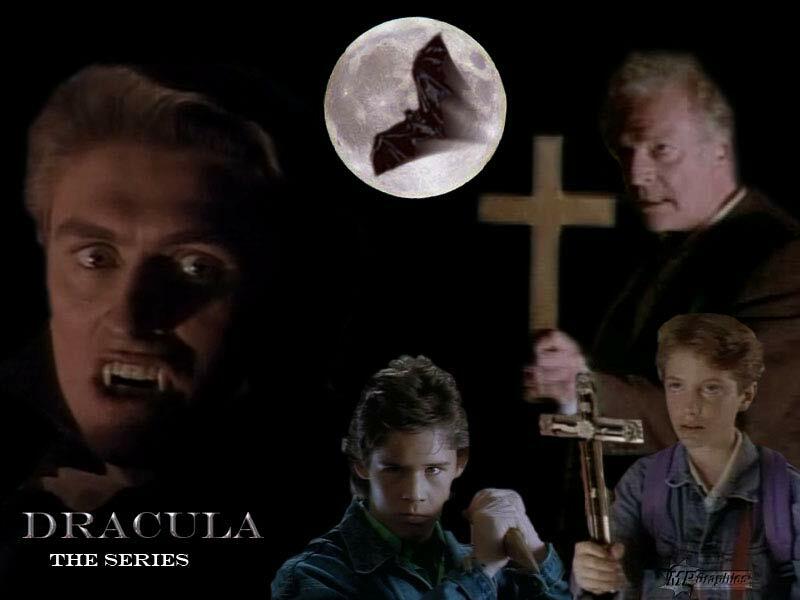 Dracula: The Series is the tale of Maximilian (please, just Max)Townsend (played by Jacob Tierney) and his family and their quest to destroy the evil Count Dracula who is living… um, unliving as an extremely wealthy modern businessman in the heart of central Europe. Dracula (played by Geordie Johnson), known to the world as successful billionaire Alexander Lucard (see what they did there? A. Lucard… Dracula backwards… clever huh?) has decided that the best way to take over the world is to take over the corporate world and the only thing standing in his way… is an eleven year old boy. Well, an eleven year old boy and his fourteen year old brother Chris (played by Joe Roncetti), their elderly uncle Gustav (played by Bernard Behrens) and Uncle Gustav’s ward Sophie Metternich (played by Mia Kirshner). As it turns out Uncle Gustav, who’s last name just happens to be Helsing, is the latest in the line of the Van Helsing family, the great vampire killers who have been hunting Dracula for centuries. When Max and Chris’ mother is transferred from America to Europe by the bank she works for she decides it would be wonderful for the boys to live with their uncle while she’s busy jet setting around the world and it’s not long before Max and Chris are caught up in the vampire hunting world of their uncle. Don’t be fooled, this show is camp to the max (heh, pun) but it’s a good kind of camp. 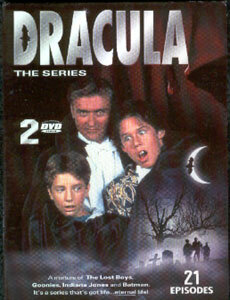 I used to watch this show when I was a kid way back in 1990 here in Canada on YTV and quite enjoyed it. I had found the DVD release of the series a few years back in the grocery store of all places and even after all those years it still holds up. What can I say, it’s a fun show, it also happens to be the debut of a young Mia Kirshner who some might remember as the grown up Sarah from The Crow: City of Angels. Dracula: The Series also stars Geraint Wyn Davies before he ever became Nick Knight in Forever Knight as Klaus, Dracula’s right hand man with a secret past. Dracula: The Series only lasted one season but like other great shows such as Erie Indiana, American Gothic and Twin Peaks perhaps Dracula: The Series was simply too far ahead of it’s time.